Super dry and cold winter days are definitely not a bonus for any skin type, especially people who already suffer from dry flaky facial skin. I have particularly dry sensitive skin and I always want to achieve a dewy skin and I want to make sure that my skin is saturated with enough moisture to stay healthy. To start with, year round I use an additional Honeywell warm air portable humidifier in my room while I sleep. They are fairly inexpensive and are superb at keeping your skin moisturized and well rested. So each night before I go to bed, I fill my humidifier tank with cold water and I turn it on. In a minute or so the humidifier starts to produce warm humid moisture that my skin is obsessed with and each morning I wake up with well moisturized skin. Warm mist humidifiers can be purchased at any larger store such as Target or Walmart, and if you want the same one that I have here is the link for it on Amazon. Also along with the humidifier I use a facial spray from Reviva that I purchase at the Vitamin Shoppe for $8.99 and a moisturizer from Cerave that I purchase from target for $12.99. I love the Rose water facial spray because it is so soothing and it contains hyaluronic acid which plumps up the skin and allows it to maintain a moisture barrier. 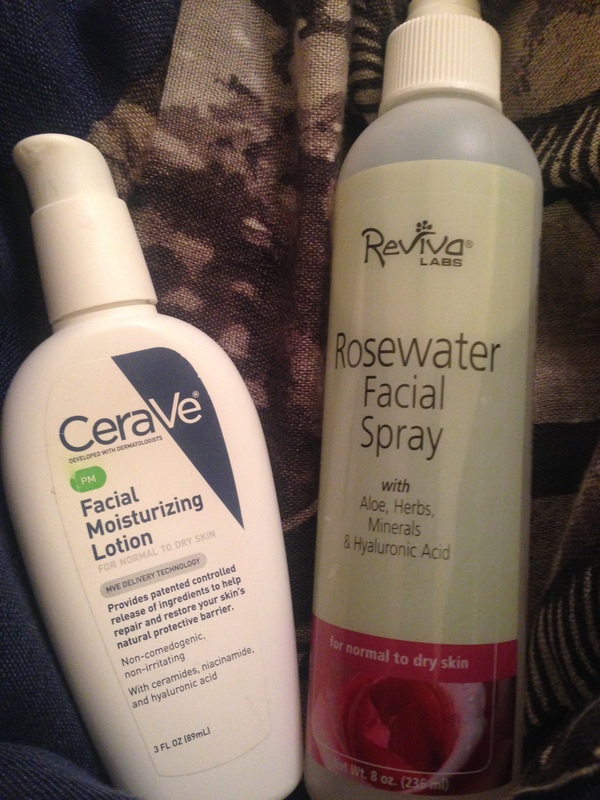 I love the Cerave PM lotion and I use is in the AM before the Natura Bisse SPF and in the evening after I have cleansed my face. Generally in the evening I clean my face, spray it with Reviva facial spray, and apply the Cerave lotion right after. The results so far have been amazing and I have been using this combination for several months. Cerave is excellent too because it contain ceramides which are great for anti-aging. Honestly this combination has done wonders for my dry skin and I feel like its fairly inexpensive as well. I use Grapeseed oil. Good for sensitive skin. Cheap. Gives a dewy complexion under foundation, too. Plus, it’s natural…can’t beat that. Just have to be careful around the eye area if you plan on wearing mascara, as it’ll smudge off on the browbone. I’m going to have to try that sounds interesting. Where do you purchase it from? Grocery?